Actually a Serengeti sunset that I snapped, but who’s counting? The sun sets fire to the Serengeti savannah as a herd of wildebeest shift nervously in the cool morning air. Not far off, you can see the stalking lioness that they can’t. It’s dramatic irony on a mortal scale. Will the hungry lion get close enough to launch herself at her prey in a storm of killing claws and fangs, or will the habitual skittishness of these oddly ugly members of the antelope family again prove vital? You are on the Serengeti at the heart of the largest movement of mammals in the world. The Wildebeest Migration carves a dusty, meandering path across this vast wilderness each year and you’re hot on its tail. Our Maasai guide walks us through the wilderness to educate us on traditional medicine. The air still retains some of the day’s warmth as they begin to dance. At first, it is just a kind of guttural humming and hooting, but as more voices join the first, it begins to take on a tune that is at once primal and familiar. Their straight-backed jumps are punctuated by dusty explosions of dry earth and high pitched screams of unrestrained jubilance. Their colourful attire takes on new hues in the shifting light of the setting sun. Behind the Maasai, the vast silhouette of Mt. Meru prematurely blots the sun. The air turns chill, but the infectiousness of the Maasai dance has gripped you. Your shoulders shrug along with them, your feet tap, and you’re swept up in it. You are at Africa Amini Maasai Lodge engaged in a cultural safari among Africa’s most famous tribal people – the Maasai. You squint into the impossibly bright midday sun and reach for the perspiring glass that sits beside your deckchair. A delicious sea breeze sweeps in off the jade waters that lap at the white sand with soothing repetition. Joining the gentle purr of the waves is the rattling of palm fronds overhead and the distant call to prayer. The breeze shifts and you catch a whiff of the spicy Indian feast that is being prepared back in the kitchens. You are on the beaches of Zanzibar, an island both exotic and steeped in history. It’s a sad reality of the increased tourism levels in Tanzania that it is getting harder and harder to have an ‘authentic’ Maasai experience. As the country modernizes and more people realize how lucrative catering to western visitors are, interactions with Tanzania’s most famous tribal residents have taken on a dynamic that is at once both predatory and desperate. Thankfully, initiatives such as the Africa Amini Maasai Lodge are working to not only bridge the gap between visitors and the Maasai but also to improve the lives of the Maasai. Sleeping out on the plains in a surprisingly comfortable Maasai boma has been one of my favourite nights in Tanzania. Founded by a German doctor, Africa Amini Maasai Lodge is a luxury lodge designed in a distinctly Maasai style. Guests can expect to overnight in comfortable Maasai style bomas soothed to sleep by the sound of the wind and awake to birdsong and an unparalleled view of Kilimanjaro at dawn. Beyond all of the bells and whistles, the lodge’s chief charm is that it is run by and for the local Maasai community. The staff who serve you a fusion of German and Tanzanian cuisine are local, the guide who takes you out onto the plains to learn about traditional medicine is a local warrior, and the women teaching the beadwork classes all hail from the nearby village. Fireside storytelling is accompanied by the meat of a freshly killed goat washed down with a hearty blood soup, but for the faint of heart, there is more palatable fare to be sampled at the on-site restaurant. For me, the highlight of any visit to the lodge is the chance to chat openly and frankly with the Maasai. Hunkered down on a makeshift seat, we chat about everything from domestic violence to warrior tradition to female circumcision to marriage law to how the men spend their free time. It’s a better education in Maasai culture than any dusty textbook or curated Wiki could ever hope to be. Read more about staying at Africa Amini Maasai Lodge. Tanzania’s unquestioned king when it comes to attracting tourists, the annual Wildebeest Migration sees more than a million wildebeest and zebra make the pilgrimage from the fertile plains of Ndutu to the Maasai Mara in southern Kenya. The massive movement of animals boggles comprehension. Even seeing a portion of its ever-moving bulk is likely to be one of the more exhilarating wildlife experiences you’ll ever have. The rumbling of hooves, the old man moaning of the herd, and the persistent odor all combine into a dizzying assault on the senses. While the herd’s movement is impressive on its own, there’s a certain bloodthirsty thrill in seeing the mortal struggles. Whether it’s the excitement of seeing a pride of lions or an opportunistic leopard picking off a member of the herd or the high drama of a river crossing – people come from all over the world for their chance to see the dance of life and death in motion. Regardless of what time of the year you visit the Serengeti, you’ll be treated to a wildlife experience that defies expectation. Animals wander the savannah in every direction, as ambivalent to the presence of gawking tourists as we might be to a curious housecat peering at us from behind shifting curtains. The plains are home not only to the fabled Big Five, but also to an African who’s who that includes gazelles, giraffes, zebras, hippos, baboons, and so much more. Learn more about the Wildebeest Migration: The Greatest Show on Earth. Alongside the broad plains of the Serengeti, the sheltered lost world of Ngorongoro Crater is one of the most diverse wilderness areas in all of Africa. A caldera in actuality, the World Heritage-listed Ngorongoro Crater is the best place in Tanzania to see the endangered black rhinoceros as it leads a lonely existence out beyond where the heat haze causes its shape to shift and swirl. A picnic lunch by Ngorongoro’s famous hippo pool offers a chance to snap this Game of Thrones style pose. Laconic wildebeest chew listlessly, penitent warthogs go down on bended knee to feed, and hippos chuckle from the safety of their watery abodes. It is in Ngorongoro that you’ll see large herds of Cape Buffalo too. These deceptively placid looking relatives of the cow are considered to be the most dangerous of the Big Five – no small feat when said group includes leopards, lions, and the mighty elephant. A Cape Buffalo regards me with vague curiousity. The Ngorongoro Conservation area is also one of the last places in Africa where tribal society and wild Africa live side by side. Maasai herdsmen usher their herds across the same ground where elephants graze, lions prowl, and hyenas skulk. All of this takes place against the backdrop of the volcanic caldera’s steep walls, a wave of stone and wood that never breaks, and instead contents itself with casting a long shadow over the crater floor. An ostrich struts across the crater floor of Ngorongoro. The so-called Roof of Africa, Mount Kilimanjaro (or Kili as it is more affectionately known) dominates the Northern Tanzanian horizon. On the rare occasions where the shy mountain chooses to remove her tattered robe of clouds, all eyes turn to her. Image courtesy of Yoni Lerner. The world’s tallest free-standing mountain, Kilimanjaro beckons thousands of ambitious climbers each year to attempt its slopes. The challenge in climbing Kilimanjaro is not in the steepness of its slopes or the precariousness of the climb, but in the altitudes at which the human body begins to come apart. Despite this, the mountain is considered one of the more climber friendly peaks in the world, and its various routes range from the often crowded ‘Coca-Cola’ to the lengthy, meandering explorations of the likes of Rongai or Lemosho. Image courtesy of Travelling Pooh. For those who perhaps aren’t up to the task of ascending to Uhuru Peak, day climbs up the mountain give a small taste of what it’s like to attempt the ascent. A hike to Kibo Hut takes you through the mountain’s most verdant region but still gets you home in time for dinner. The Maasai are far from the only tribe to call Tanzania home. At Lake Eyasi, the Hadzabe Bushmen continue to live a life that is all but extinct elsewhere in the world. Hunter-gatherers who have thus far resisted the modernization that is sweeping across the country, the Hadzabe are one of the few tribes in the country who is still permitted to hunt for their food. Image courtesy of Frans Peeters. With homemade poisons, ingenious disguises made from the remains of previous catches, and supreme stealth, the bushmen hunt out on the salt-stained shores of Lake Eyasi while the women gather fruits, roots, and vegetables tp supplement their diet. While tourists are permitted to visit with the Hadzabe and even participate in a morning hunt, tours still require a local translator. The Hadzabe tongue is one of clicks and grunts, but their welcome is no less authentic. To preserve their culture, visitors are encouraged to bring gifts such as simple foods and knives rather than money which the tribe will have no use for. Safaris aren’t all open top vehicles and dusty roads. Lake Manyara National Park is most famous for its tree-climbing lions, but the opportunity to trade the car for a canoe out on the water is another drawcard for the park. A lioness gives me the eye. Piloted by a capable local guide, your boat skims across the seasonal lake in search of wallowing hippos, indifferent Cape Buffalo, and the startling variety of birds that call the park home. If the view from the water doesn’t do it for you, the park’s newly opened treetop walk is Tanzania’s largest canopy walk – giving you a bird’s eye perspective of the park. You can also take a canoe safari in Arusha National Park. Image courtesy of Wayo Africa. The opportunity to camp side by side with some of Africa’s most iconic wildlife may frighten some, but for the truly adventurous, there’s nothing more African than falling asleep to the sinister chuckling of hyenas and the comical grunts of distant wildebeest. Whether you go bare as bones with a sleeping bag and a crackling fire or glam things up by staying in one of the many luxury tented camps that dot the national parks, a night spent out under the stars is likely to be one of the more memorable nights of your life. A wee bit of outdoor seating so you can soak in the ambiance. While brick and mortar lodges are able to offer creature comforts like WiFi and 24-hour electricity, tented camps trade a little of this for getting you closer to the action. There are even mobile tented camps that move with the Wildebeest Migration to ensure their guests are always just a short drive from the herd. Tented camps range from relatively simple affairs to ultra-luxurious affairs complete with claw foot bathtubs, four poster beds, and gourmet cuisine. The ultimate in safari luxury, a hot air balloon ride over the Serengeti gives visitors a truly unique perspective on the park. Image courtesy of Chris Parker. Starting before the dawn, your Serengeti hot air balloon safari sees you take in the majesty of the rising sun from a few thousand feet. Words can’t describe quite how peaceful things are so high above the ground, and even a movement as large as the Wildebeest Migration seems insignificant from such great heights. As if the experience of seeing the Serengeti from above wasn’t enough, touching down on the plains for a fully catered champagne breakfast is the ultimate in safari romance. It’s the perfect opportunity to pop that all-important question. The name Zanzibar has become synonymous with exotic luxury, and it’s with good reason. The beaches of Nungwi and Kendwa are among the most picturesque stretches of sand and surf in the world. Zanzibar’s beaches are a picture of the idyllic island paradise – all impossibly clear waters, gently rustling palms and soft sand. World class snorkeling and scuba diving can be found offshore, while the island’s interior is home to such varied adventures as jungle trekking and touring fragrant spice plantations. Zanzibar’s true charm is in its accessibility. While the archipelago does boast a number of five-star resorts, there are also family-friendly budget accommodations and quaint B&Bs for those with more humble accommodation needs. Want to get off the beaten path? The nearby islands of Mafia and Pemba are virtually unspoiled paradises where the jungle has overtaken former colonial settlements and reasserted themselves as nature inevitably will. Image courtesy of Rod Waddington. Zanzibar isn’t only famous for its beaches and marine reserves. In the island’s capital, Stone Town, you have a city so steeped in history that wandering its winding alleys and bustling markets is akin to time travel. A melting pot of cultures, Stone Town has elements of African, Arabic, Portuguese, English, and Indian culture painted across its aging palaces. Every building in the World Heritage listed old town has a story to tell, but there’s more sadness to this tale than there is joy. Stone Town’s architecture is a charming miture of styles from around the world. A former slave port, sites such as the Slave Markets where mainlanders were sold like cattle and the cathedral where they were imprisoned stand as sad testaments to the darker side of colonialism. Elsewhere, the former palaces of the short-lived Sultanate that once ruled the island are tattered and fading remnants of a bygone era. Despite its dark history, modern Stone Town is impossible not to love. It’s a dynamic and diverse city bursting with energy. The alleyways of Stone Town are alive with life. Mount Kilimanjaro isn’t the only worthwhile climb in Tanzania. Mt. Meru in Arusha, for example, presents a much more challenging climb than Kilimanjaro. For those wanting an adventure that their friends won’t have done, the opportunity to summit an active volcano at the dead of night might be just what the doctor ordered. The highlight of a seven-day trek that begins on the fringes of the Ngorongoro Conservation Area, Ol Doinyo Lengai’s heat is so extreme that it can only be climbed in the cool of night. For those who make the challenging climb, the reward is a stunning sunrise view of nearby Lake Natron and the Serengeti wilderness beyond. On a clear day, it’s even possible to make out Kilimanjaro. An Ngorongoro Highlands trek also includes a hike into Empakai Crater and the chance to visit villages where tourism is more novelty than primary industry. It’s the ultimate experience in immersion with both nature and the local people. Kilimanjaro isn’t strictly for climbers. For those who want to take in the mountain from a different perspective, the opportunity to cycle around its base presents a unique challenge. Taking up to a week, the lengthy bike trip takes you on a complete circuit of the mountain, passing through quiet villages and through areas of wilderness not normally seen by tourists. For those with less time (or energy), shorter rides such as the journey between Moshi and Arusha are a more manageable adventure. Check out Kili Bike Adventures to learn more. It’s perhaps impossible to truly experience a country’s culture without living there, but there are ways that you can get a taste of local life beyond the smiling faces of your guides and the staff at your lodges. A Marangu village tour is an excellent way to learn more about Tanzania’s history and its present. You’ll descend into ancient Chaga tunnels to learn about how these peaceful farmers survived Maasai raids, swim in the cool waters of an isolated waterfall, drink fresh coffee at a local tea plantation, and sample the potent banana beer that locals love. A tour of Marangu gets you away from the tourist crowds. Fancy a dip? In the bustling market town of Mto Wa Mbu (halfway between Arusha and Ngorongoro), you’ll have the chance to barter at a local market, eat a home-cooked meal in a local home, and cycle out to a nearby waterfall for a break from the hubbub. If your visit allows you more time, there are few better ways to get immersed than to go out and socialize. Arusha’s nightlife is a mixture of western style restaurants, expat-filled bars, and local night clubs full of pumping bass and late night nyama choma (BBQ). It’s a paltry offering, but even taking an hour or two out of your day to bring a little light to the lives of local orphans can make a world of difference. Local orphanages like Kibowa house kids barely old enough to walk, students struggling through their schooling, and young mothers with nowhere else to go. Desperate cries of, “Me baby! Me baby!” prologue the clinging hands and pleading eyes of kids so starved for affection that their mistrust of strangers bursts like a dam after a few minutes. My time with the kids at Kibowa was rewarding and heartbreaking. It’s an emotionally exhausting experience. The sadness of seeing the abject poverty the kids live in warring with the warmth you feel at being able to bring smiles – however temporary – to kids who don’t get a lot of reasons to smile. If you want to make a more meaningful contribution, donations of toys, school supplies, clothes, food, or even furnishings leave a lasting impact. Longer volunteer stints to help tutor kids attending local schools are also a good way to give back. As long as you remember that these are real people with very real struggles and not just a tourist attraction for you to gawk at and snap a few selfies with, you’re doing the right thing. Although it translates as ‘hot water’ in Swahili, Maji Moto is actually a deliciously cool escape from the often dry and dusty Tanzanian heat. Located a long and bumpy drive from Arusha, Maji Moto is a literal oasis in an otherwise bone-dry area of the country. The crystal clear spring is surrounded by twisted figs and succulent ferns, and it’s the perfect place to wash away the dust after a long safari. Alive with life on the weekends, you’ll even find local entrepreneurs selling chips mayai (a delicious French fry omelette) and cool drinks. A rope swing offers one way into the water for the particularly adventurous, while others can content themselves with floating in the bright blue waters. Names like Serengeti, Ngorongoro, and Tarangire are well-known in safari circles, and any would-be African adventurer worth their salt is likely to have heard of them during their travels. Less is said about Tanzania’s rugged southern parks. Far from the nation’s safari capital, Arusha, these parks are an often bumpy drive from Dar Es Salaam and offer an experience unlike what you’ll find in the well-traveled north. Parks like Ruaha and the massive Selous Game Reserve present a far wilder Africa than you’ll find on the comparatively well-maintained roads in the north. Popular attractions like elephants, lions, and giraffes can still be found here – but rarer sights such as African wild dogs are better pursued here than in the Serengeti or Ngorongoro. If big game isn’t your thing, the breathtaking Kitulo National Park is a botanist’s dream – the first park in Africa set aside purely due to its floral significance. Looking to stretch your legs? Udzungwa National Park is all about mountains, rainforest, and waterfalls. Beachside Saadani offers visitors the rare opportunity to see elephants playing in the surf, while Mahale National Park is home to Tanzania’s wild chimpanzee population. While they’re harder to get to and accommodation options are more limited, the parks of Tanzania’s Southern Circuit offer up something different than anything you’ll find elsewhere in the country. Your African safari doesn’t have to be all tented camps and quaint local lodges. More and more, high luxury properties are drawing the attention of discerning travelers from all over the world. Ultra-luxurious properties like those owned by &Beyond and Four Seasons offer world class luxury without distancing their guests from the distinct charms of their setting. A leisurely dip in the infinity pool at the Four Seasons Serengeti, for example, sees you scant metres from an active watering hole in which baby elephants play by day and predators prowl by night. The infinity pool at the Four Seasons Serengeti is a destination all of its own. &Beyond’s Crater Lodge takes the ‘room with a view’ description to a whole new level, as guests overnight in clear-walled bubbles that are at reminiscent of something out of science fiction. Zanzibar offers private island escapes and even tented camps are wowing their guests with increasingly decadent offerings. If you’re only going to visit Africa once, it makes sense to treat yourself to a once in a lifetime stay as a part of your adventure. 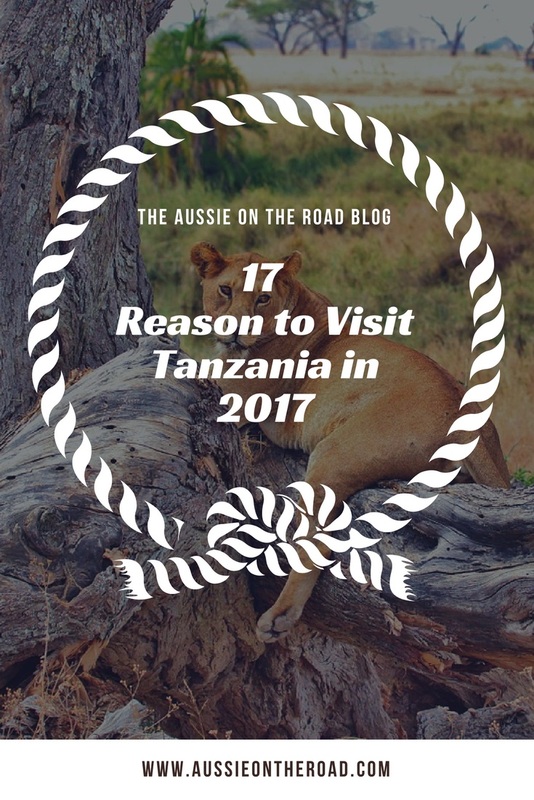 There are many more than seventeen reasons to visit Tanzania, but the above ought to whet your appetite and get you giving it some more serious thought. If you’re looking to make your Tanzanian dream a reality, don’t hesitate to get in touch. When I’m not blogging up a storm and slumming it in Asia, I’m helping people design custom safaris ranging from budget family escapes to luxurious honeymoons. You can get in touch by clicking the image below! Already planning your safari? Don’t forget anything important! Check out this safari packing list. Have your travels ever taken you to Tanzania? What were the highlights of your trip? Never been? Which of the above has piqued your curiousity? What's the Most Fun Away to Travel Around Australia? Showdown: Should I Visit Beijing or Shanghai?